Multitasking extends the power of TaskRouter by allowing workers to handle parallel tasks. In a typical call center environment agents may be handling both voice calls and messaging requests (chat, SMS, Facebook, etc ...). While it’s unlikely that workers need to handle more than one voice call at a time, you may want workers to be able to handle multiple tasks of different types - whether messaging, email, etc. Multitasking provides the logic for you to specify in what way you want workers to be able to work on more than one task at a time. In reality you may want to block worker from handling anymore Tasks if they are busy with Voice Task. To address this use case TaskRouter provides the following pre-defined attributes that you can use to write an appropriate Target Worker Expression in a Workflow. This attribute returns total number of tasks that are assigned (this includes states "pending", "accepted" and "wrapping") to a specific channel for the worker. 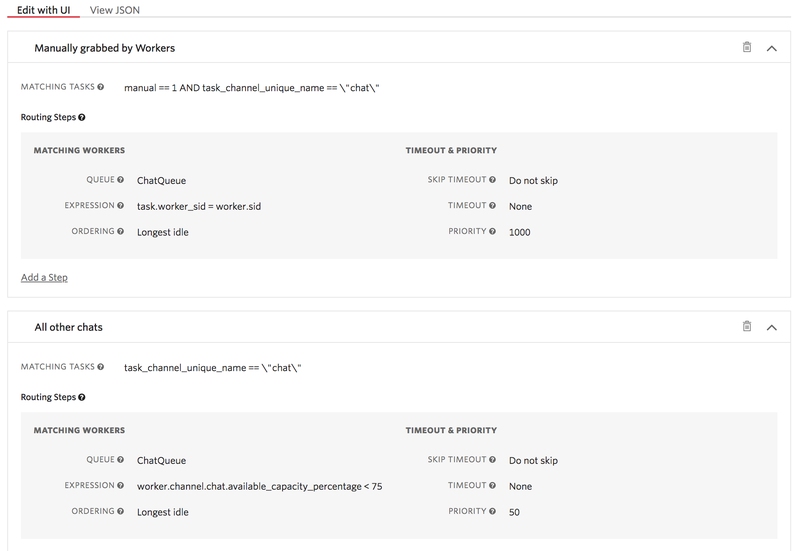 For example, if the worker is currently handling 2 Chat Tasks and 0 Voice Tasks then, worker.channel.chat.assigned_tasks returns 2 while worker.channel.voice.assigned_tasks returns 0. In the first phase, we have released five custom TaskChannels (Custom1, Custom2, ..., Custom5) in addition to the five default TaskChannels that are created when Multitasking is enabled. If you already have Multitasking enabled, please disable and enable Multitasking for the custom TaskChannels to show up in your workspace. In the future you will be able to add, rename, delete custom TaskChannels. Please stay tuned, custom channels are coming soon ... If you need one sooner, contact support with your use case. You can continue to expose the existing statistics and we will provide more Task Channel specific statistics soon. If you have request for some specific statistics and metrics please contact support. This workflow assigns a high priority to manually selected tasks and then applies Target Workers Expression to look for worker where the task.worker_sid matches the sid of the worker. Any other task would be added to the queue with lower priority and are routed by TaskRouter based on the worker capacity.